Gum recession is what happens when your delicate periodontal (gum) tissue pulls away from where it should be, leaving the roots of the teeth exposed and putting you at risk for a host of oral health issues. At Westside Dental Associates, we see gum recession in adult patients of all ages — and we want to help prevent and treat receding gums in Los Angeles. Keep reading to find out more about keeping your gum tissue healthy in this week’s blog post! 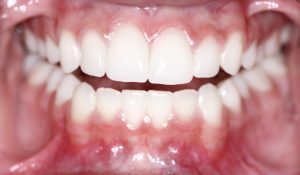 Why Do Receding Gums Occur? There are a few things that could cause the gums to pull away from where they should be against the teeth. Perhaps most common is periodontal (gum) disease — infection in the space between the teeth and the gum tissue results in the gradual deterioration of healthy gums. People who are at a higher risk of developing gum disease are also more likely to experience gum recession. Aggressive tooth brushing or using a brush with hard bristles can wear away at the gum tissue, too. If you are experiencing gum recession, you’ll probably notice the following warning signs. Left untreated, gum recession puts you at a higher risk of developing a special type of tooth decay called root decay. Especially damaging, it occurs on the surface of the exposed teeth’s roots. Gum recession also contributes to tooth loss. If your gums are receding, talk to your dentist about treatment. Having enough healthy periodontal tissue to cover up your teeth roots is important for continued oral health and wellbeing. Dr. Latner treats gum recession with gum grafting procedures. Gum grafting is an oral surgery in which your dentist uses healthy donor tissue from elsewhere in your mouth and sews it onto the area where gums have been lost. If serious infection is still present, periodontal therapy is needed first. An initial gum surgery can remove the bacteria, kill infection, and help you enjoy better oral health overall. Gum recession presents a number of issues for oral health — but it’s easy to prevent with proper oral hygiene habits. First of all, make sure you are brushing your teeth for two minutes, twice a day, and flossing daily. Use a soft-bristled toothbrush and clean in gentle, circular motions rather than hard back and forth motions. Visit your dentist every six months for additional help preventing receding gums. These regular appointments will help us help you keep gum disease — the leading cause of gum recession — at bay. We can also provide prompt treatment for early infection when we see your smile frequently. Do you have questions about gum recession in Los Angeles, or are you ready to schedule an appointment for preventive care? We are ready to help. Please get in touch with Westside Dental Associates today! by: Les Latner at July 31, 2017 .